In the 1930s they were a staple of American movies, stalking big game and sometimes finding King King or Mighty Joe Young, not to mention the more unscrupulous among them meeting up with an angry Tarzan or Jungle Jim. Big Game Hunters have been politically incorrect for some time now as people have come to realize the implications of hunting species to extinction. 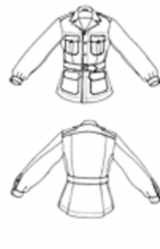 #H211 Long sleeved jacket with cuffed sleeves, turndown collar and front breast and below wiast pockets. Belted. Unlined. 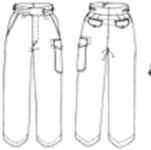 #H212 Long pants with zippered fly and cuffed legs. Side and rear pockets. Unlined. 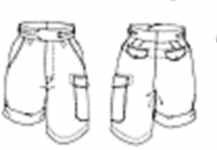 #H213 Above knee shorts with side and rear pockets and cuffed legs. Zippered fly closure. Unlined.